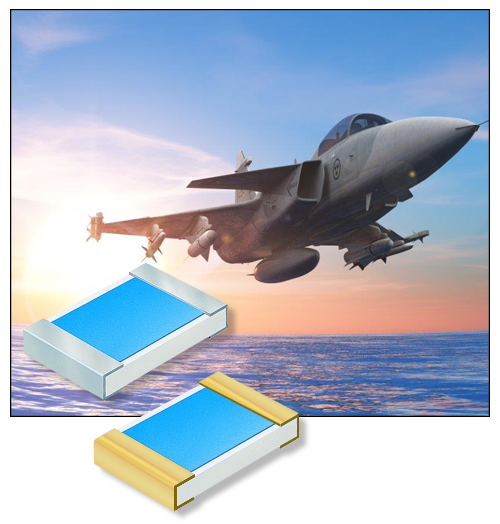 DECEMBER 12, 2018 - New Yorker Electronics has released the State of the Art (SOTA) Precision Thin Film MIL-PRF-55342 Chip Resistors. The SOTA MIL-PRF-55342 provides established in reliability fixed chip resistors for a variety of cases, product levels, temperature characteristics, tolerances and termination materials. These chip resistors are used in many different mission critical applications such as avionics, satellites, biomedical, communications and weapons systems. As such, they have strict performance requirements. Each resistor receives power conditioning (burn-in) for 100 hours as part of the Group A test. In addition, each manufacturing lot receives a Group B test (Inspection lot formation is not allowed for T level). SOTA manufactures all T level products by up-screening R or S level resistors, an additional step to further enhance the reliability of the T level. SOTA MIL-PRF-55342 includes precision and semi-precision part numbers that use thick film and thin film materials and processes to provide the complete range of part numbers. SOTA precision thin film chip resistors have resistance tolerances of ±0.1, ±0.25, and ±0.5% and/or temperature coefficient of resistance of ±25 and ±50 ppm/°C. Thin film materials are sputter deposited and patterned using photolithography. These thin film resistor materials exhibit lower current noise and lower drift than semi-precision thick film resistors. SOTA is widely considered a mission-critical specialist and is a leading supplier of thick and thin film resistive components to these industries. In fact, State of the Art has been qualified to supply MIL-PRF-55342 film chip resistors since 1980. All resistor products are made in the USA at its State College, Pennsylvania facility. SOTA uses the same design, materials, quality systems and production line to produce standard, hi-rel and QPL military products. As a longtime franchise distributor of State of the Art, New Yorker Electronics supplies its complete line of Military Grade and Standard Grade Chip Resistors, Zero Ohm Jumpers & Resistors, Military Jumpers, Untrimmed Resistors, Space Level Resistors, Silicon Resistors, Resistor Networks, Fixed Chip and Coplanar Attenuators, and other High Power and High Frequency Resistors.